7/22/2014 - Here's a Vedalken Orrery on a stick. But not as strong as Teferi, Mage of Zhalfir (who single-handedly turned off an entire keyword of cards from his own block). I enjoy this idea because it's a blue analog to cards like Generator Servant and… huh; I could've sworn there was a 1/1 goblin that sacked to grant haste. I feel like Greatreef Relay ought to be white in line with Scout's Warning, while a blue analogue should be limited to quicken or flash for artifacts. I could see that. I could even see green. They've been oscillating on that a bit; not sure where it netted out. 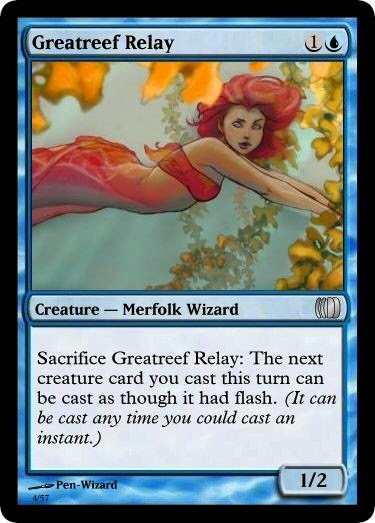 I think Greatreef Relay can be a 1/1 flier so it has some relevance (plus it makes thematic sense). 1/1 flier would work and be more attractive. What's the thematic connection? t: Add G to your mana pool. Spend this mana only to cast a creature spell. You may cast that spell as though it had flash. I'm going to call that uncommon, and possibly rare. I'm definitely on Rare, but that doesn't make it any less awesome. A sac-to-grant-haste gob would inevitably be flavored as bait. I refuse to believe in a universe where this didn't happen. I'm seriously confounded it doesn't already exist. Surely it's just worded strangely and I missed it in my search. Sacrifice ~: Target creature gains haste until EOT. For real! You can find a goblin that sacs for any other red effect (and some not so red), but I guess they haven't gotten to this particular crossroads yet.